Below you will find all of the forms and guidelines you need to propose a course, Pathways Minor, Alternative Pathway, or Special Study to the Pathways General Education program. Whether you are proposing a brand new course, an existing CLE course, or an existing non-CLE Course for Pathways, use the Course Proposal Form listed below. Then explore the other documents posted here to help you draft a successful proposal. If you have already begun filling out a prior version, you are welcome to copy-and-paste all of your responses into this latest version OR continue on your current version and just insert (copy-and-paste) any new parts. All Version 1s will be accepted. The Registrar's Office will review the Coversheet and Part I of each Pathways Course Proposal using this common review sheet. This form was added 10/11/16 and updated in 02/26/18. The Ad Hoc Review Committee will review each Pathways Course Proposal using a common review sheet. Here is a DRAFT of the Pathways Course Proposal Review Sheet to help guide the proposal completion process. This form last updated on 02/26/18. The following SAMPLE proposal can serve as a model for Pathways course proposal completion. Notice in the margins that the review committee has added tips and advice to support a successful submission. This document was added 6-20-2017 and updated in 02-26-2018. This form is to be used ONLY by those courses which have already been approved for Pathways during the last year and would like to meet the newly added Critical Analysis of Equity and Identity in the United States core concept. To meet this concept, a course must include a majority of the student learning outcomes (3 out of 5). NOTE: A course can only be approved for a maximum of two core concept. Therefore, if this course was approved previously for two core concepts (e.g. Critical Thinking in the Humanities and Reasoning in the Social Sciences) then one will need to be replaced by this one. All courses must also still meet one integrative concept. 1. Fill out only the parts of the form where changes have been made to the proposal. For example, if the catalog description has had to change to reflect verbiage from the new concept, then fill out that section. However, if the previously approved student learning outcomes already reflect this new concept, then skip that section. Only add the approval signatures if your college has requested to see the updated proposal again (will vary by college). Focus on pages 3 and 4 (Part II) to justify that your course will offer opportunities for students to meet this concept. 2. Email the form to Stephen Biscotte (biscotsm@vt.edu) who will digitally amend your previously approved proposal to include this new information, submit it to UCCGE for approval, then submit the report to CUSP for final approval of the revision. You will be notified at various points in this process (much like you were for the original approval). 3. Once approved at CUSP, we will get your course revised in the timetable to reflect the new concept in time for next Fall's rollout! Interested in tagging your upcoming Special Study (1984, 2984, etc.) with Pathways credit in advance of offering to help build student enrollment and better pilot the course for Pathways? Complete the process outlined on the following form and submit documentation at least a month before the conclusion of the semester prior to offering. Interested in tagging your upcoming Study Abroad (2954, 3954, etc.) with Pathways credit in advance of offering to help build student enrollment? Complete the process outlined on the following form providing at least 2 weeks for the committee to review it during the academic year. 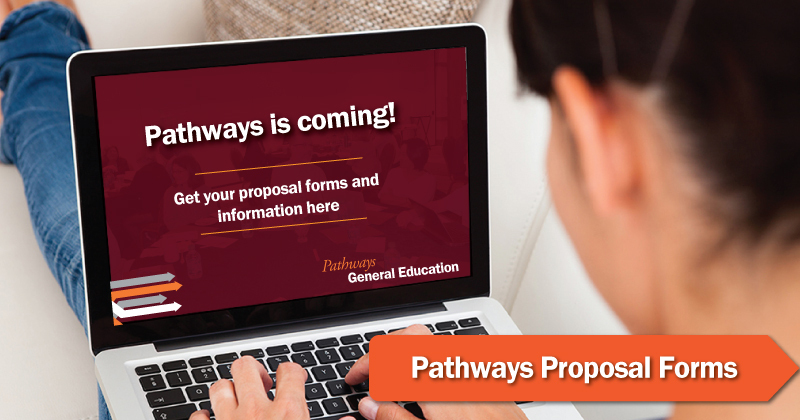 Whether you are proposing a brand new minor or an existing minor for Pathways, you will use this Pathways Minor Proposal Form. There is also a checklist to help guide you through the components of a completed application. This Version 1.2 form was updated to reflect the language change on 2-26-18. If you have already begun filling out previous versions, you are welcome to continue or copy-and-paste into this version. Both will be accepted. This checklist was created to help guide Pathways Minor developers in meeting the requirements of a Pathways Minor as well as completing the 'packet' needed to submit the minor to governance. This version was updated in August 2018 to reflect the language change. The Ad Hoc Review Committee will review each Pathways MINOR Proposal using a common review sheet. Here is a DRAFT of the Pathways MINOR Proposal Review Sheet to help guide the proposal completion process. This form last updated on 02-26-18.. If you are faculty member proposing an Alternative Pathways (e.g. leading a study abroad trip, overseeing an undergraduate research for non-majors program, etc.) you will use the Faculty-Initiated Alternative Pathway Proposal Form. If you are a student seeking credit for an upcoming Alternative Pathway, then use the Student-Initiated Alternative Pathway Proposal Form. There is a review sheet to help guide you through the components of a successful application. This Version 1.2 was updated on 02-26-18 to reflect the languge changes. The Office of General Education and the UCCGE will use this common review sheet to review each Alternative Pathway. Here is a DRAFT of that review sheet to help guide the proposal completion process. This form was last updated in 02-26-18.